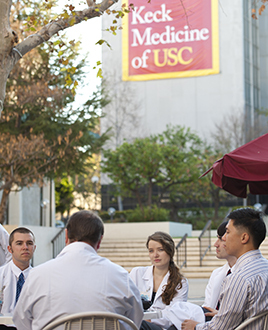 The Keck School of Medicine of USC is adjacent to the Los Angeles County+USC Medical Center — one of the largest teaching hospitals in the United States. Keck's faculty, students and residents serve more than one million patients each year through the Los Angeles County+USC Medical Center, the USC Norris Cancer Hospital, the Keck Hospital of USC, Children's Hospital Los Angeles, and a network of USC-affiliated hospitals throughout Southern California. Here, students Andrew Clark, Jennifer Carleton-Nathan, James Chalfant and Anthony Yi talk with their instructor. Photo by Chris Shinn Photography. Founded in 1885, the Keck School of Medicine of USC is part of Keck Medicine of USC, a major center of medical research, education and patient care with more than 1,500 full-time faculty members and a voluntary faculty of more than 4,000 physicians. Faculty includes national leaders in each of its 25 clinical and basic science departments. Located on the university's 30.8-acre Health Sciences Campus three miles northeast of downtown Los Angeles, the Keck School is adjacent to the Los Angeles County+USC Medical Center, one of the largest teaching hospitals in the United States. The Keck School of Medicine of USC participates in the centralized American Medical College Application Service (AMCAS) and also requires the submission of the Keck School of Medicine supplemental application. Approximately 7,500 applications are received per year and 750 applicants receive interview invitations. Interviews begin in late August and end in early March. Students receive acceptance letters beginning in October. The Committee on Admissions reviews all information submitted on the AMCAS application as well as the school's supplemental application. The nonrefundable supplemental application fee is $100. The Keck School of Medicine has developed an MD/PhD program designed for individuals who aspire to a career in academic medicine or a leadership role within the biomedical industry. Students are expected to acquire the modern skills that are required for physician competence. Additionally, the MD/PhD program provides an opportunity for the development of research expertise and academic excellence while fulfilling the requirements for a PhD degree. A joint program between the Keck School of Medicine and the California Institute of Technology (Caltech) was established in fall 1997 for the granting of the MD/PhD degree. PhD studies may be carried out at Caltech or through collaboration between two laboratories at both institutions. The MD will be awarded from the Keck School of Medicine and the PhD will be awarded from Caltech. The MD/PhD executive committee is responsible for selecting students for the MD/PhD program. Members of the committee review the qualifications of each applicant, including MCAT scores, academic performance, letters of recommendation and research experience. The committee interviews candidates and then selects students for admission to the program. All applicants to the joint program interview at Keck School of Medicine and the California Institute of Technology. The MD/PhD program enrolls a maximum of four students annually. Students have the option of doing the PhD at USC or Caltech. Each student accepted to the program must also be accepted to the Keck School of Medicine. All positions are fully funded. Admission requirements for the MD/PhD program are those of one of the graduate programs at Caltech, the Keck School of Medicine and USC. Students select the program of their choice during the first two years of the medical curriculum; descriptions of these programs are available from each department or program and Caltech. To assist the MD/PhD Committee in its evaluation of candidates, applicants to the MD/PhD program are encouraged to provide recent GRE scores. The committee does not, however, require GRE scores in order to consider an application. Applicants to the Keck School of Medicine are advised to request information about the MD/PhD program at the time of application. In addition to completing the medical school application, applicants should indicate their interest in the MD/PhD program. Students who are currently pursuing the medical curriculum at the Keck School of Medicine may apply to the MD/PhD program by contacting: MD/PhD Program, Keck School of Medicine, 1975 Zonal Avenue (KAM 200), Los Angeles, CA 90089-9023; (323) 442-2965, FAX: (323) 442-2318. All applicants are screened by members of the MD/PhD Executive Committee; candidates who meet the basic criteria of the program are then invited to be interviewed by members of the committee and faculty at USC and Caltech. Students selected for acceptance to the MD/PhD program are notified between November and May of each year. Students begin their program in the fall semester and register for courses in the medical curriculum at that time. Further information about the MD/PhD program at the Keck School of Medicine may be obtained by contacting: MD/PhD Program, Keck School of Medicine, 1975 Zonal Avenue (KAM 200), Los Angeles, CA 90089-9023; (323) 442-2965, FAX: (323) 442-2318; email: med.mdphdpgm@med.usc.edu. The tuition and fees listed below are estimated for fall semester, 2016. All fees are subject to change without notice by action of the University of Southern California Board of Trustees. The university reserves the right to assess new fees or charges. Tuition is not refundable; late registration fees are mandatory and cannot be waived. Tuition for each semester of the medical school curriculum is due and payable at the beginning of the semester. Registration is not permitted after the third week of instruction. Late payment of tuition is subject to a mandatory late fee. Average budgets for medical students will vary according to their year in the curriculum. Sample budgets for Year I, Year II and the Junior/Senior Continuum may be requested from the Office of Financial Aid. Tuition, mandatory fees and parking are the same for all years. Faculty instructors are responsible for establishing evaluation criteria appropriate to the objectives of each course, discipline and clerkship, and for specifying the manner in which evaluative information is to be gathered. Instructor comments on student performance form an integral part of a student's total evaluation. For each evaluation, descriptive comments based on the student's overall performance in relation to course criteria are submitted for permanent file to the office of the senior associate dean for student affairs and educational affairs, together with performance reports. The student's permanent file is used to prepare a letter from the senior associate dean of student affairs and educational affairs of the Keck School of Medicine, which accompanies student applications for internships and residencies. These records are maintained by the Office of Student Affairs; students may review their records during regular office hours by scheduling an appointment. During the lifetime of the physician, the permanent student record may be consulted as evidence of completion of the required curriculum and as certification for licensure. The Keck School of Medicine and its departments offer types of curricula leading to award of: the Doctor of Medicine; joint MD/PhD; joint MD/MBA; joint MD/MPH; MD/MS, Global Medicine; a Master of Academic Medicine, MAM; Global Medicine, MS; PharmD/MS, Global Medicine; Global Health, BS; Health Promotion and Disease Prevention Studies, BS; graduate degrees in conjunction with the Graduate School in Applied Biostatistics/Epidemiology, MS; Biochemistry and Molecular Biology, MS; Biostatistics, MS, PhD; Cancer Biology and Genomics, PhD; Cell and Neurobiology, MS; Clinical, Biomedical and Translational Investigations, MS; Development, Stem Cells, and Regenerative Medicine, PhD; Epidemiology, PhD; Experimental and Molecular Pathology, MS; Medical Biology, PhD; Molecular Epidemiology, MS, PhD; Molecular Microbiology and Immunology, MS; Molecular Structure and Signaling, PhD; Nurse Anesthesia, MS; Physiology and Biophysics, MS; Psychology and Public Health, PhD/MPH; Stem Cell Biology and Regenerative Medicine, MS; Integrative Biology of Disease, PhD. The Department of Family Medicine has one academic division: the Division of Physician Assistant Studies, which offers the Master of Physician Assistant Practice. The Department of Preventive Medicine has two academic divisions: the Health Behavior Research Division, which offers a BS, Global Health; BS, Health Promotion and Disease Prevention Studies; BS, Global Health/Master of Public Health; BS, Health Promotion and Disease Prevention Studies/Master of Public Health; Master of Public Health; PharmD/Master of Public Health; PhD, Physical Therapy/Master of Public Health; PhD, Preventive Medicine (Health Behavior Research); and the Biostatistics Division, which offers MS programs in Biostatistics, Molecular Epidemiology, and Applied and Biostatistics/Epidemiology. The division also offers PhD programs in Biostatistics, Epidemiology, and Molecular Epidemiology. In addition, departments of the school have certificate programs in certain medical specialties. The Medical Education Committee (MEC) is responsible for overall planning of the medical school curriculum. Separate curriculum committees plan and supervise the instructional programs for each year of medical school. Each of the committees includes student representatives and faculty members from the departments involved in each year's teaching program. The curriculum of medical education at USC continues to emphasize preparation of the student to give optimal patient care. Students are progressively involved in patient care beginning with their first semester. The curriculum is patient-oriented, and students are expected to assume increasing responsibility for patient care as they acquire sufficient knowledge and skills. During the clinical experiences of the Junior/Senior Continuum students eventually attain a level equivalent to that of an intern. At the same time, the school recognizes that the explosion of knowledge and techniques brought about by the current "biotechnology revolution" is rapidly altering the practice of medicine. During the four years of medical school, students cannot be taught all that will be needed for the practice of medicine — either now or in the years ahead. To a far greater degree than in the past, the present curriculum encourages students to acquire skills and habits of self-education and self-instruction that will prepare them for lifelong learning. The faculty of the school recognize that while most students will eventually practice medicine, some will choose an academic research career. The plan of medical education fosters the development of individuals whose careers may be directed along this path. Faculty are available to counsel and encourage research participation by students during their medical school training. The curricula of the Keck School of Medicine and its departments acknowledge the crucial place of basic medical science in the advance of modern clinical practice. Both basic and clinical science are taught throughout the four years of the undergraduate medical curriculum. Basic science is taught both as pure basic science and in correlation with clinical science. In addition, a number of the school's departments cooperate with the USC Graduate School to offer degree courses leading to the award of the Master of Science and Doctor of Philosophy. Most of these graduate courses may also be taken as part of the school's joint MD/PhD program.